This Rawsome Vegan Life: AN ADAPTOGENIC PROTEIN LATTE! I am very excited to share this recipe with all of you. It is a powerful drink that I make sure to have every morning because of its big time benefits. I have noticed improvements in my mood, energy, motivation and sleep since I began blending this up daily a couple months ago. As many of you might know, mental illness - depression and anxiety - is a serious bummer in my day-to-day. It makes it challenging for me to enjoy life, get out of bed, or see the point in anything. I am constantly trying to tweak my lifestyle habits to help alleviate these symptoms of hopelessness, fatigue, and worry. I have taken medication in the past and am 100% an advocate of it if it's right for you. That being said, I am attempting to do all I can within my diet, exercise routine, sleep schedule, and spiritual self-care to boost my mood without the need for pharmaceuticals. I have been feeling SO GOOD these past several months, and this recipe has played a part. This is one of the only times in my life where I am getting out of bed without dreading the day; where I look forward to existing, seeing friends, working, and studying; where I am motivated to create, to experiment, to experience, to be. I cannot express how valuable this is in words. It is a gift. This isn't to say that I jump off my mattress every morning singing with the birds. During a recent weekend, my familiar blues returned for a couple days, and I had to sit with them and work through them, but hey- I came out the other side. This is, in essence, a reversal of what I have normally experienced in my life: usually I would feel exhausted and depressed, with a few precious weeks of each year being bright; but now I feel great most of the time, and only the odd day or two I have trouble getting out of bed or being motivated. This is, by far, the longest stretch of sustainable happiness I have been graced with. I believe the ingredients in this drink are some of the myriad contributors to this turn-around (along with a number of other lifestyle habits). They include mushrooms like chaga, reishi, turkey tail, lion's mane, and cordyceps; ashwagandha; astragalus; and maca. These foods are adaptogenic, which means they can help your mind and body cope better with stress. Some have anti-cancer and anti-inflammatory properties. They have been consumed in Traditional Chinese Medicine and Ayurvedic practices for millennia, and have been proven with scientific research to benefit mental and physical well-being (though some have been more thoroughly researched in Western methodologies than others). I've also included cinnamon, for blood health, and pea protein, to maintain my muscles and keep me satisfied for longer. 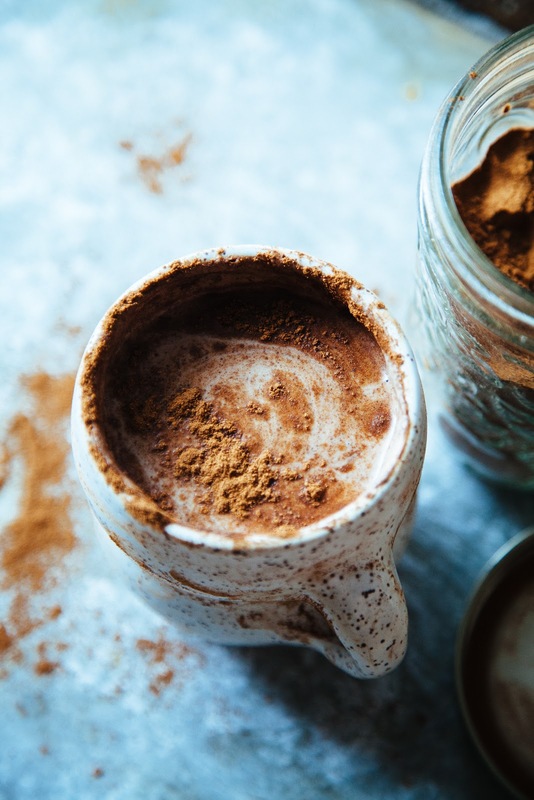 This drink tastes like a rich, creamy mug of earthy hot chocolate, and I can't wait to dive into it every day, knowing all the favours it's doing for me. As far as brands, I do have my favourites here if you were wondering. I'm a big fan of Nuzest's Clean Lean Protein. It tastes incredible and contains just a few ingredients. For mushrooms and other adaptogens, I prefer Harmonic Arts. Their sourcing is high quality, and it's their 14 Mushroom Powder that I use everyday. I'm an affiliate with these companies, but these thoughts are my own, and I genuinely do love their products. Blend all ingredients until smooth. Add cinnamon if desired. Pour into a mug and sprinkle extra cinnamon on top. Sip and enjoy! - If you want it a bit sweeter, add a banana, extra couple dates, a pinch of stevia, or 1 tablespoon of maple syrup. - Instead of coconut milk, you can use 1 tablespoon of nut butte, or coconut butter.